Café-Scientifique about obesity: now online! 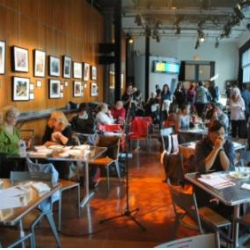 The Café-scientifique held last April 27th at the Monument National, in conjunction with the 2nd National Summit on Obesity April 22, prompted a discussion between MUHC Research Institute experts and participants on the stigma and prejudices surrounding this 21st-century epidemic. The MCH’s own Dr. Laurent Legault participated in the event.